The latest performance benchmarks of Intel’s Core-X series Core i7-7800X, Core i7-7820X and Core i9-7900X CPUs have been spotted at Geek Bench. The latest benchmarks show Intel’s high-end, multi-core processors with a whole lot of performance in single and multi-threading workloads. More performance results of the Intel Core-X series processors including the Core i7-7800X, Core i7-7820X and the Core i9-7900X have appeared in the GeekBench 3 database. The benchmarks can be directly compared to AMD’s Ryzen processors to see what kind of performance advantages do the new Intel CPUs deliver in single and multi-threaded workloads. The Intel Core i7-7800X is an entry level Skylake X processor featuring 6 cores and 12 threads. The chip comes with clock speeds of 3.5 GHz base and 4.0 GHz boost and ships with 8.25 MB of cache. The processor features support for quad channel DDR4 memory with speeds rated at 2400 MHz (OC+) and includes 28 PCIe lanes. The chip is compatible with the new LGA 2066 socket based X299 motherboards and will feature a TDP of 140W. The chip is expect to cost $389 US which brings us to its competitor. Since this is a 6 core chip, we want to compare it against AMD’s flagship 6 core offering, the Ryzen 5 1600X. Although the chip is $120 US cheaper than Intel’s part and ships with similar specs along with a lower TDP and clock speeds of 3.6 GHz and 4.0 GHz, we wanted to get an idea of what the performance looks like on both AMD and Intel 6 core parts. 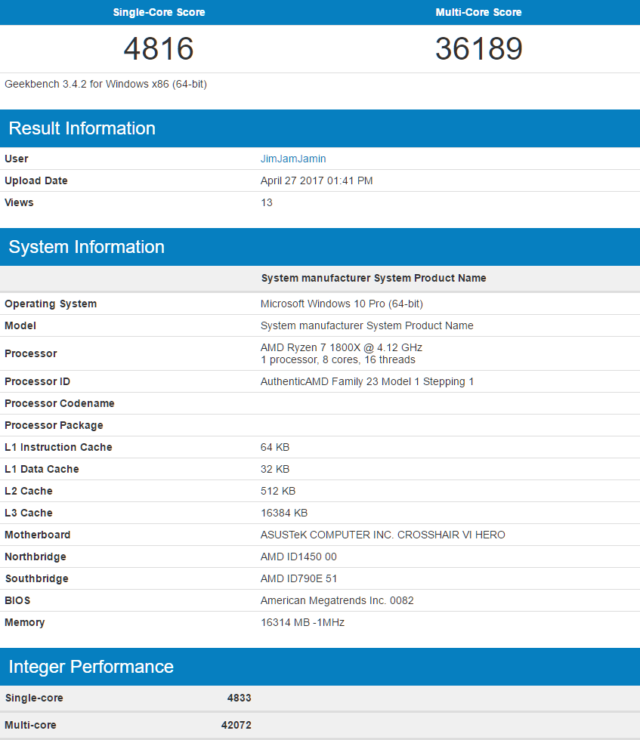 In the benchmark posted over at the GeekBench 3 database, the Intel Core i7-7800X scored 6134 points in single and 37344 points in multi-threading tests. The chip was tested on an X299 Xpower Gaming AC motherboard and overclocked speeds were used. The highest score listing for the Ryzen 5 1600X chip features a score of 5956 points in single and 36061 points in multi-threading. This listing had the Ryzen chip overclocked to 5.4 GHz. A stock configuration yielded scores of 4204 points in the single and 25556 points in the multi-threading tests. The Intel Core i7-7820X has also been tested on both stock and overclocked settings. 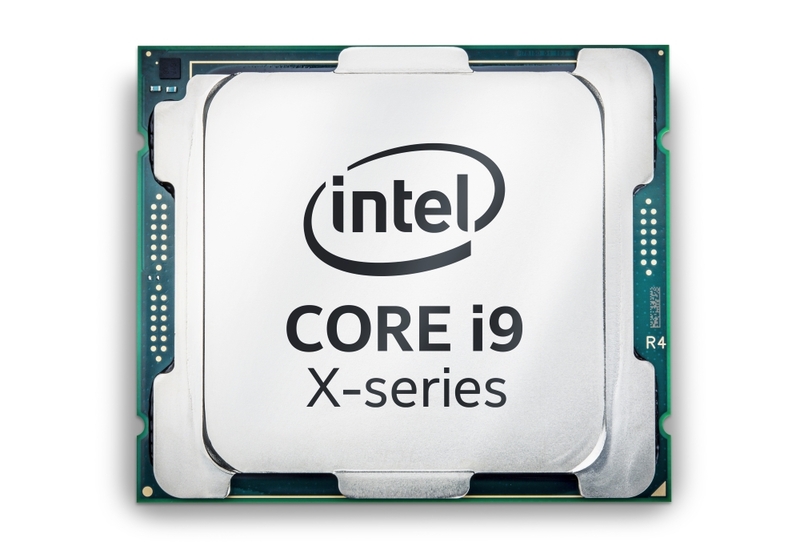 The chip is the fastest 8 core model of the Skylake X family and features 8 cores, 16 threads with a total cache of 19 MB (L2+L3). The chip is clocked at 3.6 GHz base, 4.3 GHz boost and a max boost 3.0 clock of 4.5 GHz. These frequencies are much higher than the Core i7-7800X but results in a slightly higher priced part. The Core i7-7820X costs $599 US, this puts the price at $100 US high compared to AMD’s flagship Ryzen 7 1800X CPU. The chip supports a 140W TDP and is compatible with the LGA 2066 socket. In the first set of tests, we spot an Intel Core i7-7820X running at overclocked speeds. The chip scores 6034 points in single threaded and 47032 points in multi-threading tests. We selected the highest score for the Ryzen 7 1800X listed on the Geekbench 3 database. 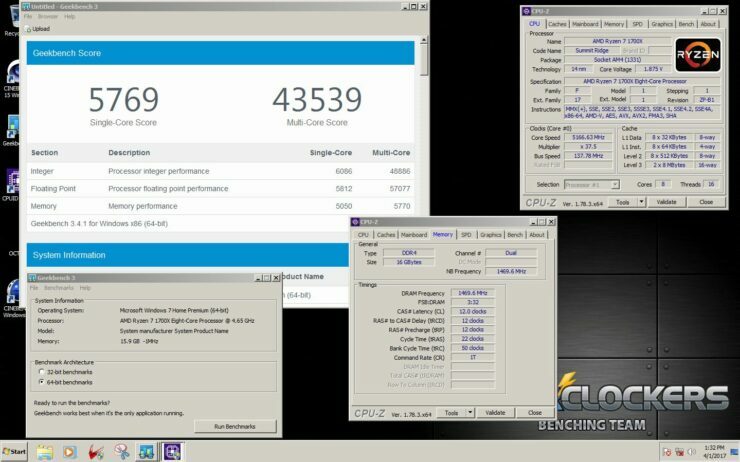 The competitor chip scored 4816 in single threaded and 36189 points in multi-threading tests with an overclock of 4.12 GHz. At default clocks, the highest score for the Ryzen 7 1800X chip was 4387 points in single-threaded and 34647 points in multi-threading test. 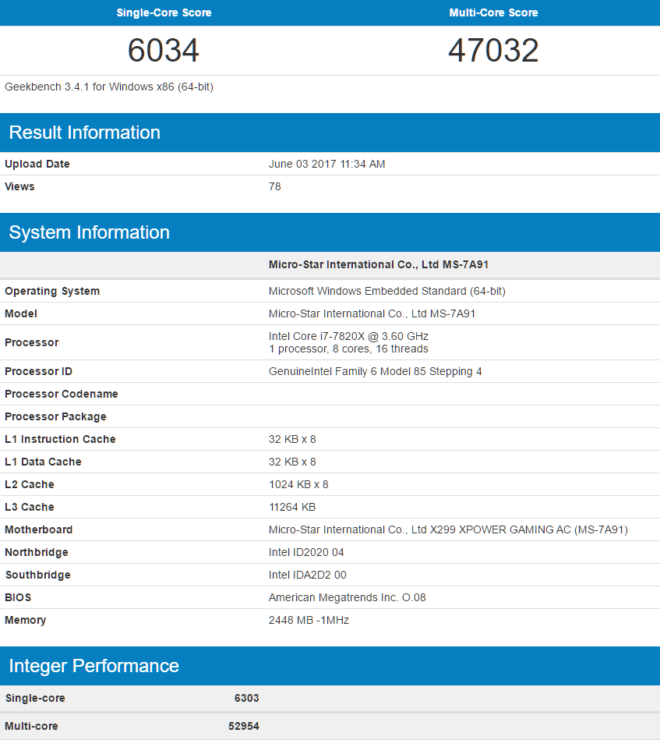 The Intel Core i7-7820X was overclocked to very extreme clock frequencies of 5802 MHz using LN2 cooling. 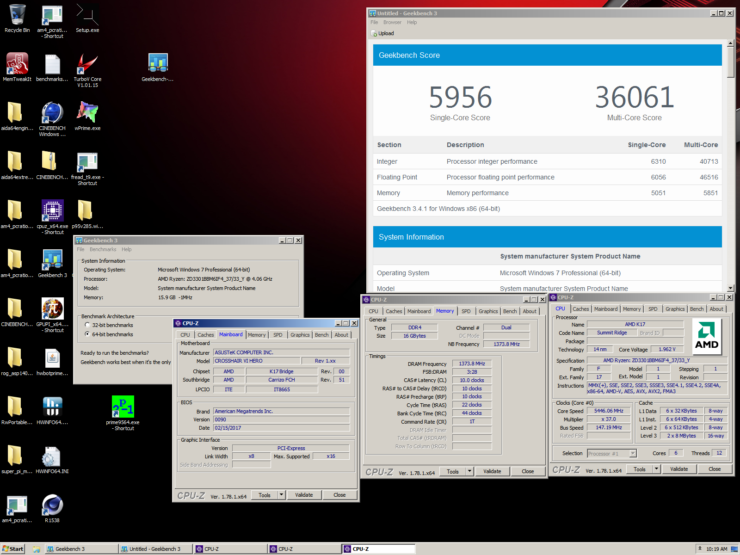 This overclock resulted in a score of 6138 points in single-threaded and 47869 point in the multi-threading test. Similarly, a maximum overclock for the Ryzen 7 1700X was used with clocks of 5165 MHz and that chip resulted in a score of 5769 points in single-thread and 43539 points in the multi-thread test. While the overclock speeds of both chips are different, it shows that Intel does provide higher overclock headroom compared to Ryzen parts which top out at 4.1 GHz on air and just a couple 100 MHz over 5 GHz using LN2. Finally, we have the Intel Core i9-7900X, a 10 Core, 20 Thread replacement to the Core i7-6950X. 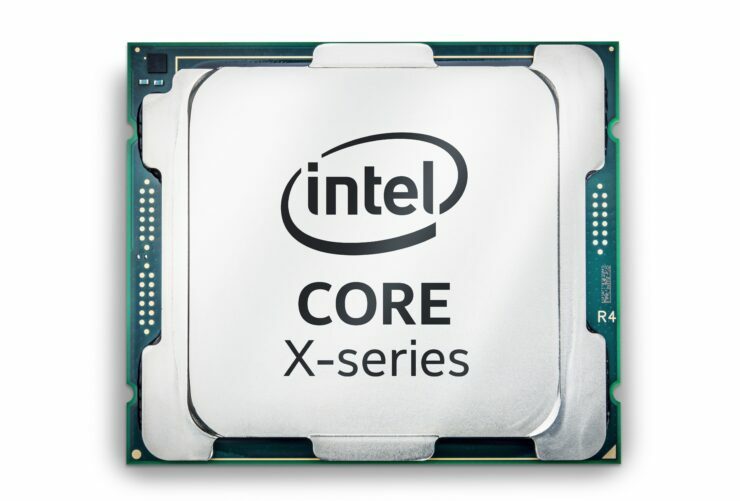 The latest Skylake-X 10 core features clock speeds of 3.3 GHz base, 4.3 GHz boost and a max 3.0 frequency of 4.5 GHz on single and dual core optimized workloads. The chip features 13.75 MB cache (L3) and has a TDP of 140W. 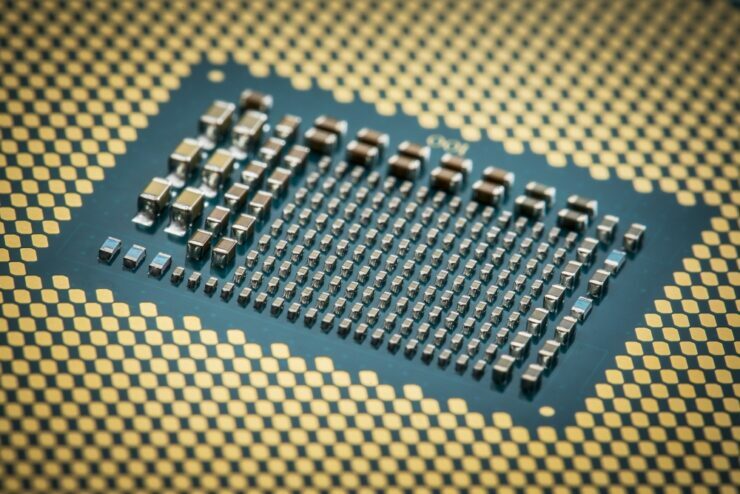 This chip will cost $999 US and is priced over $600 US lower compared to 6950X’s launch price. The Intel Core i7-6950X features clock speeds of 3.0 GHz base, 3.5 GHz boost and 4.00 GHz max boost 3.0 frequency. We selected from the best performing Core i7-6950X chip on Geekbench 3 database. This chip scored 5657 points in single and 53041 points in multi-threading tests. The Intel Core i9-7900X tested was overclocked on LN2 like the Core i7-6950X and overclocked beyond 5 GHz. 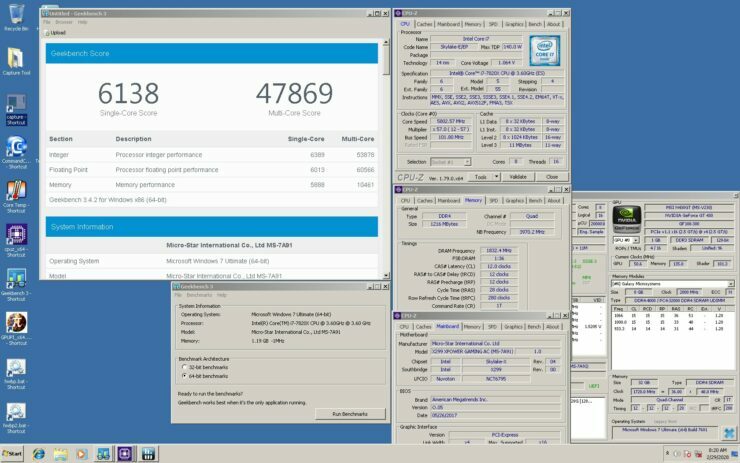 The OC configured Core i9-7900X published scores of 6158 points in single-thread and 57806 points in multi-threading tests. 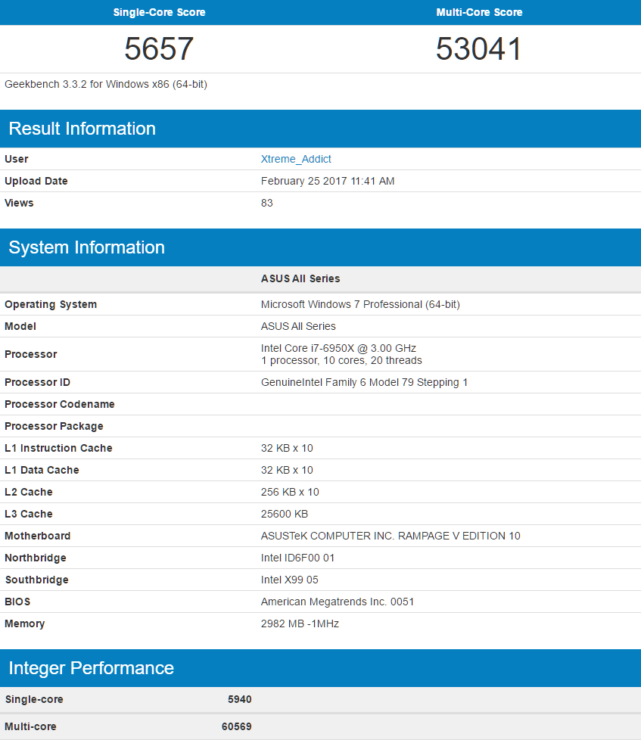 That’s it for Geekbench 3 scores but expect more benchmarks in the coming weeks. 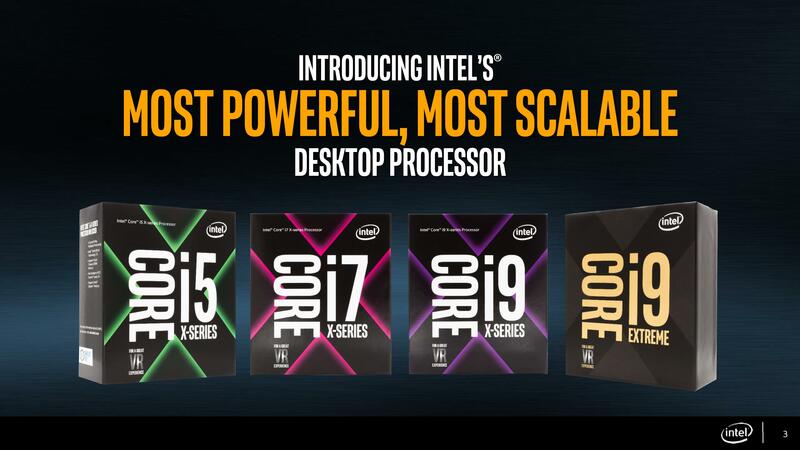 The Intel Core X series NDA lifts officially on 12th June followed by sales starting on 26th of June. For full coverage of the Intel Core X series lineup, you can visit the link here.